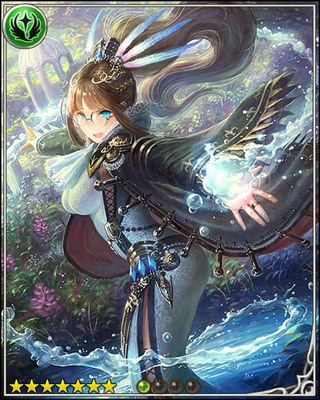 Who would've thought that one of the best new anime of the season would be based off of a generic-looking free-to-play mobile card game? 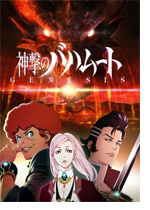 Yes, Rage of Bahamut comes from a strange place, but barely resemble its source material anyway. 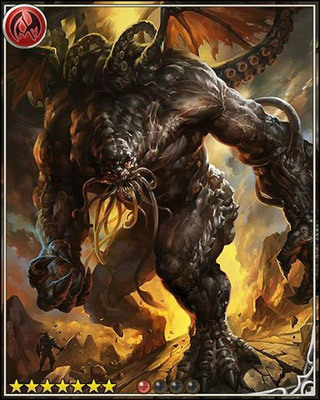 While it pulls some character and monster designs from the game, the rest is almost entirely original content. And that original content is so, so good. 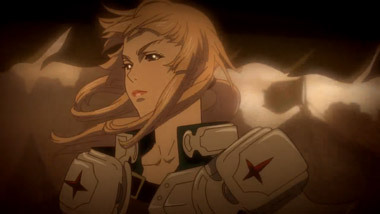 Rage of Bahamut: Genesis opens with not one, but two well-animated action sequences. 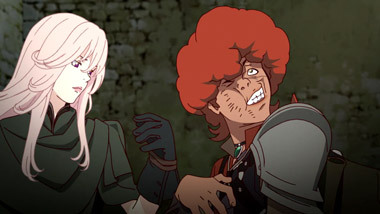 After the all-important backstory segment, it barrels headlone into an uproarious chase scene, introducing us to two of the main characters, Favaro Leone and Kaisar Lidfard. They ride their horses across rooftops, send a water wheel tumbling through town, and accidentally interrupt some criminals in the process. It's mildly reminiscent of Pirates of the Caribbean, while also being just as ridiculous as you might expect an anime to be. 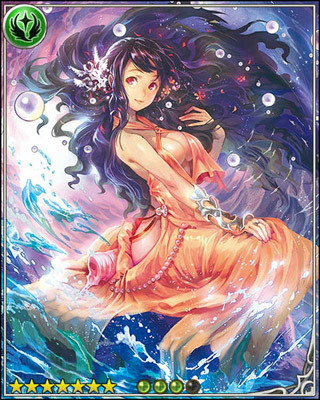 Despite being based on a digital card game, the cards themselves take up a very small portion of the show. 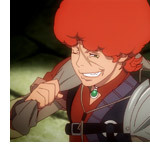 Favaro and Kaisar are bounty hunters, and upon defeating a bounty, they're captured in a card to be cashed in. Otherwise, it's all focused around a fantasy adventure. 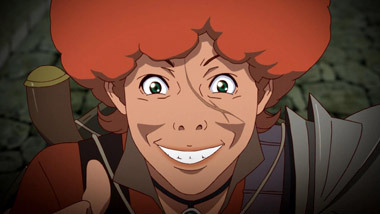 When Favaro (who is fairly unique as a protagonist, given his curly red hair and generally jerkish nature) encounters Amira, a girl looking for her mother, he lies about knowing how to get to Helheim, and the two run off with Kaisar in close pursuit. 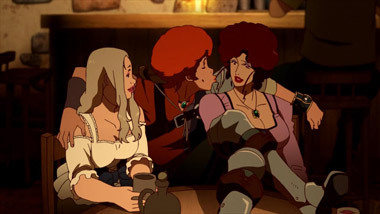 Favaro isn't very nice. In fact, he's a jerk. His horse is more heroic than him, you might find. The various background characters all feel fairly unique, from various robbers and tavern-goers, to a talking duck. He's a god, he'll have you know. The world building isn't extreme, but it does feel natural. If you're wondering how this show could end up being good despite all odds, you might want to take one look at the staff. The director? None other than Tiger & Bunny's Keiichi Sato. 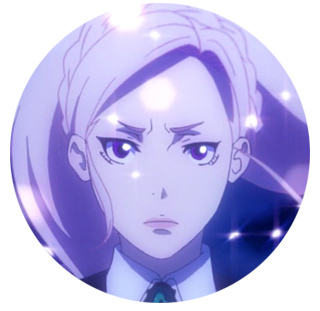 Sato has done a lot of impressive directorial work in the past, and brings a unique angle to anime he works on. 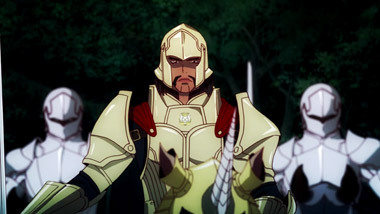 He often sets things up as though he was filming live-action, and avoids many of the stereotypical "anime" camera angles. Also behind the excellence: MAPPA. The studio is putting the pedal to the metal here, with fluid, dynamic animation. 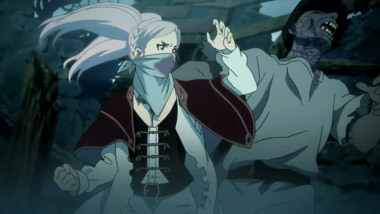 As mentioned above, the first episode opens with two well-animated action sequences that are pretty wide in scope, and features another stellar fight scene near the end. Episode two dazzles with a delightful and energetic dance between two characters. Every episode has something that'll grab you with its attention to detail and fluidity. MAPPA is putting all of that free-to-play cash to good work. 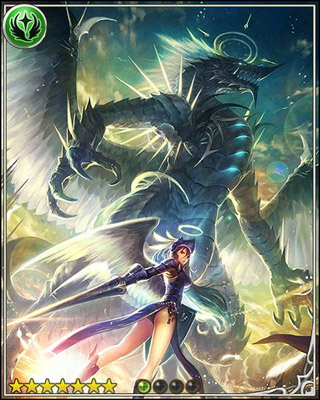 Bahamut is also surprisingly funny. The humor relys more on physical comedy and well-timed jokes rather than wordplay, which makes the translator's job a bit easier, for sure. The flow from scene-to-scene is brisk as well, never letting boredom set in. The script also does a solid job of showing rather than telling. Overly long explanations are jettisoned in place of entertaining dialogue full of characterization. 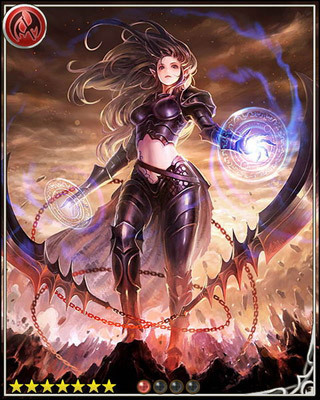 It's hard to believe where Rage of Bahamut came from. 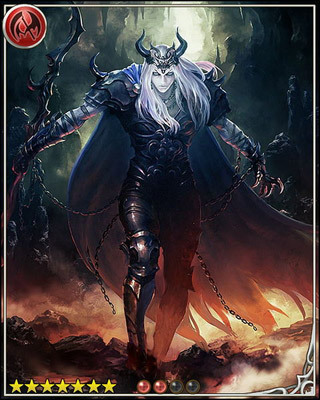 All you have to do is Google images of the cards to see that this show could've gone down a very different path. Fortunately, it didn't! Instead, Keiichi Sato has crafted a surprisingly entertaining raucous adventure that's the star of the season. 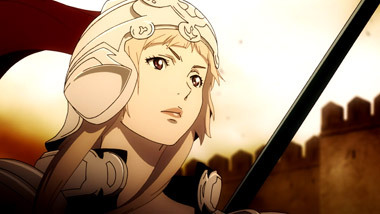 Don't let the premise turn you off, and enjoy one of the best new series this year in Rage of Bahamut: Genesis. 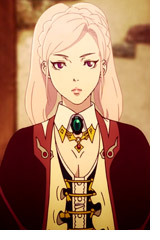 Below: Scenes from Rage of Bahamut: Genesis. 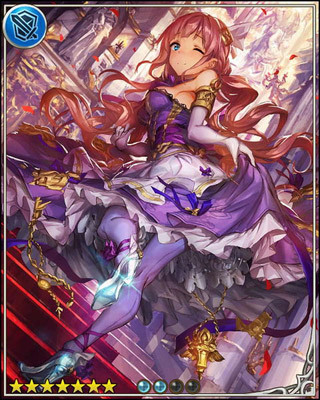 Below: Cards from Rage of Bahamut.